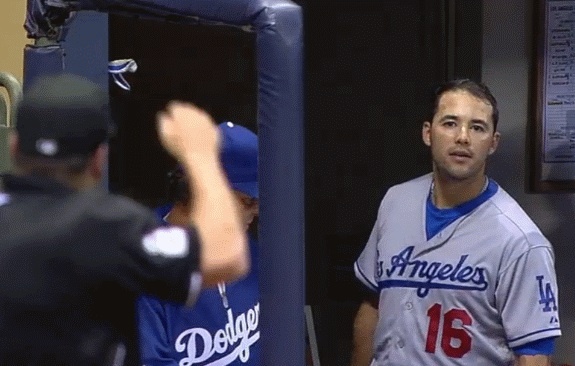 Andre Ethier gives the umpire a dead stare after being ejected from the game for arguing balls and strikes with the umpire. The Dodgers went on to lose that game to the Milwaukee Brewers 5-2. Ethier is signed to a huge contract that runs potentially through the 2018 season. He has struggled at the dish – hitting .252/.340/.730, with just 4 HRs and 15 RBI. There hasn’t really been much players have been consistent in the Dodger roster. The only guys who have been the most consistent is Gonzalez, Crawford, Clayton Kershaw and Hyun-Jin Ryu. While not trying to use injuries as an excuse, something’s gotta give and some folks have begun pointing fingers at Dodgers skipper Don Mattingly. 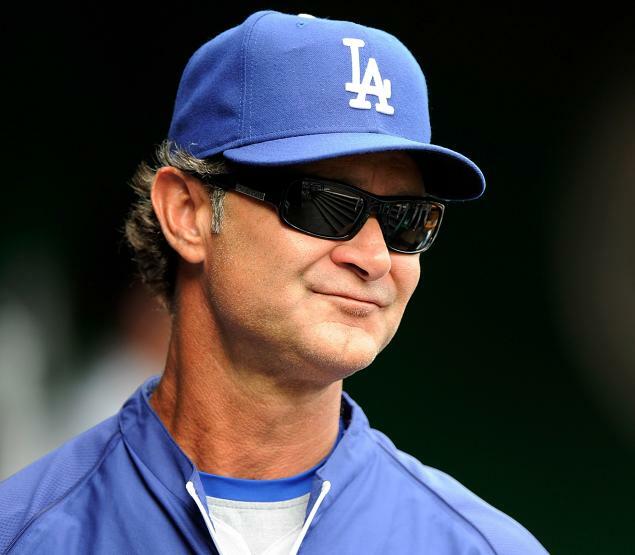 For the last week or so there has been speculation that Mattingly is in his last few games as the Dodgers manager. The rumors began last week after the Dodgers were swept by the Atlanta Braves in Turner Field. But then again, who ISN’T losing to the Braves nowadays. The Braves have the 2nd best record in the National League. After a the Braves series, the Dodgers went Milwaukee for a three-game set against the Brewers in which everyone was speculating that this would be Mattingly’s last series. Dodgers’ president Stan Kasten in the other has been quoted to say, Mattingly’s job is safe. Regardless, the Dodgers are in desperate needs for some change if they want to compete in the division for the rest of the season but should the Dodgers should find a new skipper? Now I don’t have all the answers but I personally don’t feel the need to go with a new skipper during the season. Especially if it’s within the current coaching staff. 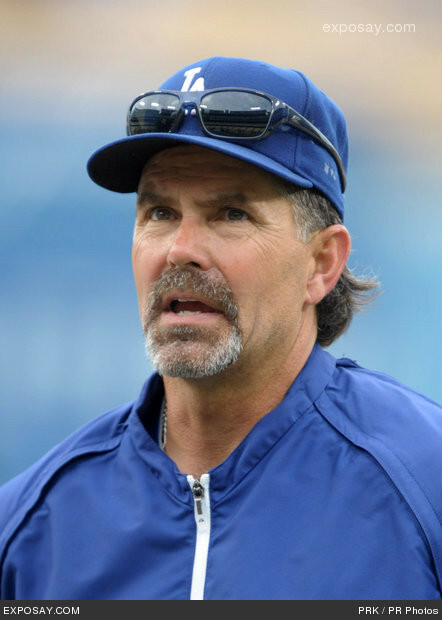 Dodgers Bench Coach Trey Hillman has been rumored to replace Mattingly for the Dodger skipper job if Mattingly gets fired. Hillman has managed the Kansas City Royals for three years and earned himself a 152-207 record. He is the only current coach who has managed an MLB team. For one, none of the current coaches have been anymore successful as managers. Current bench coach Trey Hillman has previously managed the Kansas City Royals from 2008-2010 but has a record of 152-207. Third Base coach Tim Wallach has been a successful manager, but in the minor leagues. He has managed the Albuquerque Isotopes and compiled a 152-135 record. I can’t really see an available manager that can give that change Dodgertown desperately needs and wants. A few other skippers that have been mention is former White Sox and Marlins manager Ozzie Guillen and Tony LaRussa. Let’s begin with Ozzie. Ozzie has experienced success with the White Sox but after spending one year in a highly talented Miami Marlins ballclub, he managed to do nothing with the club. He ended the season with a 69-93 record. Not to mention he had issues with current Dodger Hanley Ramirez. The idea of Ozzie managing the Dodgers is much worse than anything. LaRussa in the other hand, is the only exception to my “don’t fire Mattingly during the season statement.” That’s the only reason why they want to go with a new manager. LaRussa is currently retired but if Ned Colleti (Dodgers GM) can talk LaRussa out of retirement and reunite with Mark McGwire to coach a potential power-house lineup then I think all joy will head the Dodgers way. But as of now, it’s all on the Dodger players to play into their true potential and save the Dodger season and I think Colleti should give Mattingly until at least the end of the season. The Dodgers are currently 20-27 good enough for last in the NL West and 6.5 behind first place. On Saturday they defeated the St. Louis Cardinals 5-3 to even up the series 1-1. Tomorrow afternoon they will call on their ace Clayton Kershaw to go for the win of the series against the best record team in the NL and to “save” Mattingly’s job. Today’s feature was prepared by our Dodgers Correspondent Enrique Rivera. 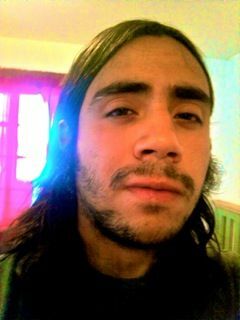 Enrique was born in Los Angeles and raised in Compton, CA. He has been a Dodger fan since he was introduced to the greatest sport of all time. ‘Eriq’ also has written a couple of baseball stories for another website here . Eriq has also talked Dodger baseball on a college radio show called LA Sports Weekly. I love to blog about music, movies and even sports. Please subscribe! Posted on May 26, 2013, in MLB Teams: Articles and Analysis, The Rest: Everything Baseball and tagged @eriqwiththeq on twitter, adrian gonzalez, andre ethier, Atlanta Braves, carl crawford, clayton kershaw, don mattingly, enrique rivera, hanley ramirez, Hyun-Jin Ryu, josh beckett, los angeles dodgers, mark mcgwire, matt kemp, nick punto, nl west, ozzie guillen, san francisco giants, stan kasten, Tim Wallach, tony larussa, Trey Hillman, zack greinke. Bookmark the permalink. Leave a comment.